3 FCT : PROJECTOS DE INVESTIGAÇÃO CIENTÍFICA E DESENVOLVIMENTO... Page 3 of 13 «Obras» de Platão. Isto torna-o também um muito original e dinâmico projecto de preservação da herança cultural. 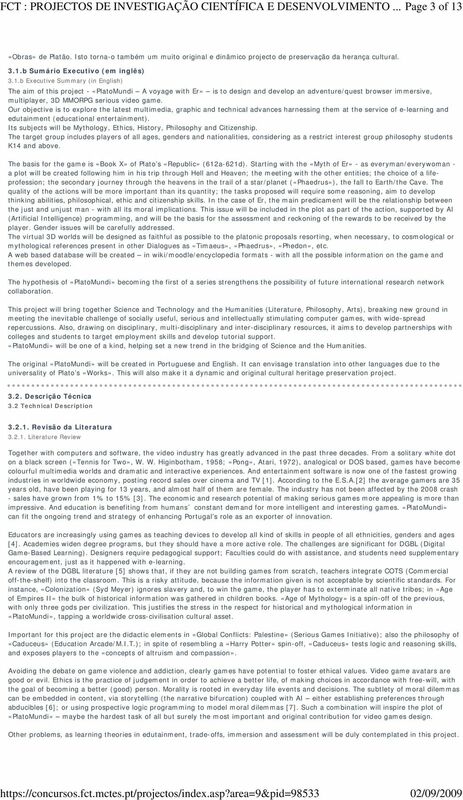 3.1.b Sumário Executivo (em inglês) 3.1.b Executive Summary (in English) The aim of this project - «PlatoMundi A voyage with Er» is to design and develop an adventure/quest browser immersive, multiplayer, 3D MMORPG serious video game. Our objective is to explore the latest multimedia, graphic and technical advances harnessing them at the service of e-learning and edutainment (educational entertainment). Its subjects will be Mythology, Ethics, History, Philosophy and Citizenship. The target group includes players of all ages, genders and nationalities, considering as a restrict interest group philosophy students K14 and above. The basis for the game is «Book X» of Plato s «Republic» (612a-621d). Starting with the «Myth of Er» - as everyman/everywoman - a plot will be created following him in his trip through Hell and Heaven; the meeting with the other entities; the choice of a lifeprofession; the secondary journey through the heavens in the trail of a star/planet («Phaedrus»), the fall to Earth/the Cave. The quality of the actions will be more important than its quantity; the tasks proposed will require some reasoning, aim to develop thinking abilities, philosophical, ethic and citizenship skills. In the case of Er, the main predicament will be the relationship between the just and unjust man - with all its moral implications. This issue will be included in the plot as part of the action, supported by AI (Artificial Intelligence) programming, and will be the basis for the assessment and reckoning of the rewards to be received by the player. Gender issues will be carefully addressed. The virtual 3D worlds will be designed as faithful as possible to the platonic proposals resorting, when necessary, to cosmological or mythological references present in other Dialogues as «Timaeus», «Phaedrus», «Phedon», etc. 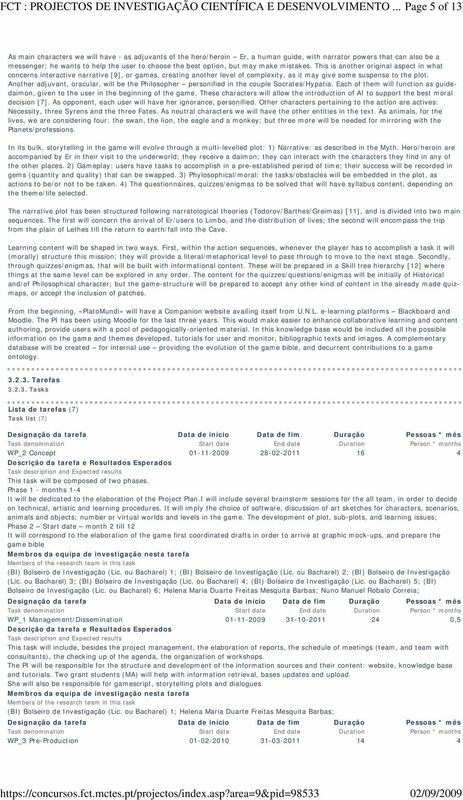 A web based database will be created in wiki/moodle/encyclopedia formats - with all the possible information on the game and themes developed. The hypothesis of «PlatoMundi» becoming the first of a series strengthens the possibility of future international research network collaboration. This project will bring together Science and Technology and the Humanities (Literature, Philosophy, Arts), breaking new ground in meeting the inevitable challenge of socially useful, serious and intellectually stimulating computer games, with wide-spread repercussions. Also, drawing on disciplinary, multi-disciplinary and inter-disciplinary resources, it aims to develop partnerships with colleges and students to target employment skills and develop tutorial support. «PlatoMundi» will be one of a kind, helping set a new trend in the bridging of Science and the Humanities. The original «PlatoMundi» will be created in Portuguese and English. It can envisage translation into other languages due to the universality of Plato s «Works». 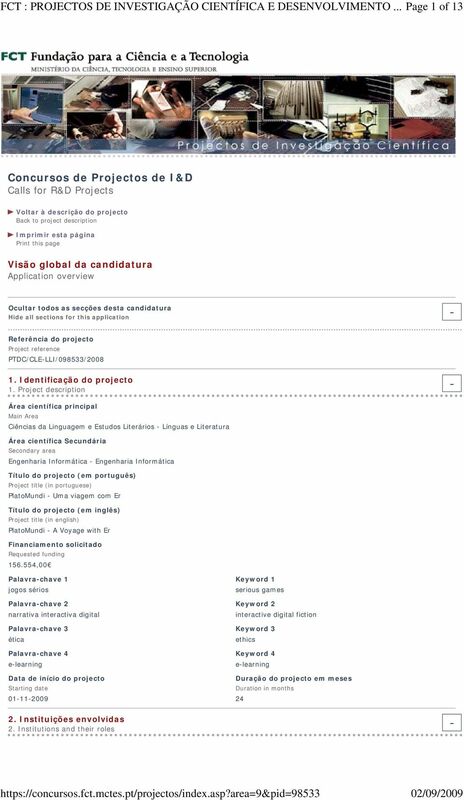 This will also make it a dynamic and original cultural heritage preservation project Técnica 3.2 Technical Revisão da Literatura Literature Review Together with computers and software, the video industry has greatly advanced in the past three decades. From a solitary white dot on a black screen («Tennis for Two», W. W. Higinbotham, 1958; «Pong», Atari, 1972), analogical or DOS based, games have become colourful multimedia worlds and dramatic and interactive experiences. And entertainment software is now one of the fastest growing industries in worldwide economy, posting record sales over cinema and TV . According to the E.S.A. the average gamers are 35 years old, have been playing for 13 years, and almost half of them are female. The industry has not been affected by the 2008 crash - sales have grown from 1% to 15% . The economic and research potential of making serious games more appealing is more than impressive. And education is benefiting from humans constant demand for more intelligent and interesting games. «PlatoMundi» can fit the ongoing trend and strategy of enhancing Portugal s role as an exporter of innovation. Educators are increasingly using games as teaching devices to develop all kind of skills in people of all ethnicities, genders and ages . Academies widen degree programs, but they should have a more active role. The challenges are significant for DGBL (Digital Game-Based Learning). Designers require pedagogical support; Faculties could do with assistance, and students need supplementary encouragement, just as it happened with e-learning. A review of the DGBL literature  shows that, if they are not building games from scratch, teachers integrate COTS (Commercial off-the-shelf) into the classroom. This is a risky attitude, because the information given is not acceptable by scientific standards. For instance, «Colonization» (Syd Meyer) ignores slavery and, to win the game, the player has to exterminate all native tribes; in «Age of Empires II» the bulk of historical information was gathered in children books. «Age of Mythology» is a spin-off of the previous, with only three gods per civilization. This justifies the stress in the respect for historical and mythological information in «PlatoMundi», tapping a worldwide cross-civilisation cultural asset. Important for this project are the didactic elements in «Global Conflicts: Palestine» (Serious Games Initiative); also the philosophy of «Caduceus» (Education Arcade/M.I.T. ); in spite of resembling a «Harry Potter» spin-off, «Caduceus» tests logic and reasoning skills, and exposes players to the «concepts of altruism and compassion». Avoiding the debate on game violence and addiction, clearly games have potential to foster ethical values. Video game avatars are good or evil. Ethics is the practice of judgement in order to achieve a better life, of making choices in accordance with free-will, with the goal of becoming a better (good) person. Morality is rooted in everyday life events and decisions. The subtlety of moral dilemmas can be embedded in content, via storytelling (the narrative bifurcation) coupled with AI either establishing preferences through abducibles ; or using prospective logic programming to model moral dilemmas . Such a combination will inspire the plot of «PlatoMundi» maybe the hardest task of all but surely the most important and original contribution for video games design. Other problems, as learning theories in edutainment, trade-offs, immersion and assessment will be duly contemplated in this project. 4 FCT : PROJECTOS DE INVESTIGAÇÃO CIENTÍFICA E DESENVOLVIMENTO... 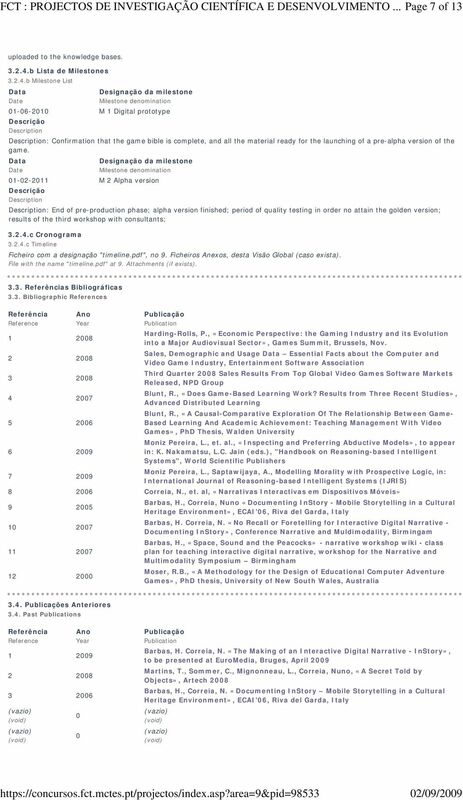 Page 4 of 13 Although this is the first time the PI presents a proposal, she became familiarized with project management in 2004 and 2005 when called by the European Commission (FP6) as Independent Expert (evaluator and rapporteur) in the areas of Human Sciences, and Artificial Intelligence. Academically, her «Habilitation» in Literature and Cyberarts culminates a double path of opposite interests Arts and Sciences - that have oriented her interdisciplinary work. She enrolled in a Master of Applied AI (2003) coordinated by Professor L. Moniz Pereira who invited her to become a researcher for CENTRIA (2005). Fundamental was the practice acquired with the participation in «InStory», a cultural heritage project developing personalized interactive narratives in mobile devices coordinated by Professor Nuno Correia, with Glorianna Davenport from M.I.T. as consultant. The PI was responsible for story creation, scriptwriting and content retrieval. Her task was to develop narrative content and games for a PDA and the outcome was the questionning of the traditional literary concepts, first sketched  and then more maturely revised . Her seemingly hectic itinerary was armoured with the national and international courses, conferences and workshops she attended. In Valencia - «GameOn 2008» her communication included a sketch of «PlatoMundi» and had very positive feedback. The PI is teaching (F.C.S.H.) seminars in Literature and New Media, Cyberarts, and e-learning as well as (F.C.T.) Scientific and Technical Communication. This later gave her the opportunity of contacting with teaching staff and students of Computer Studies. With this itinerary the PI believes she has the necessary background, vision and understanding of the problems to be addressed. As to Plato s «Works», she chose the «Myth of Er» due to its visual quality and narrative potential as an exploratory experience towards using humanistic content in games; novelty comes also from being a dynamic alternative to the mere static conservation of cultural heritage. In what concerns Professor Nuno Correia, from CITI, and his research team, the Interactive Multimedia Group, they are surely well known for the quality of the work developed, that has received several international awards. They have more than 50 papers published all over the world. His research areas range from augmented reality, to edutainment, and he has been working on several aspects of describing, processing, delivering and presenting multimedia information Plano e Métodos Plan and Methods As referred, the aim of this project - «PlatoMundi A voyage with Er» is to design and develop an adventure/quest browser immersive, multiplayer, 3D MMORPG serious video game. Its subjects will be Mythology, Ethics, History, Philosophy and Citizenship. The basis for the game is «Book X» of Plato s «Republic» (612a-621d) and the objective to create a virtual 3D world as faithful as possible to the platonic proposals. 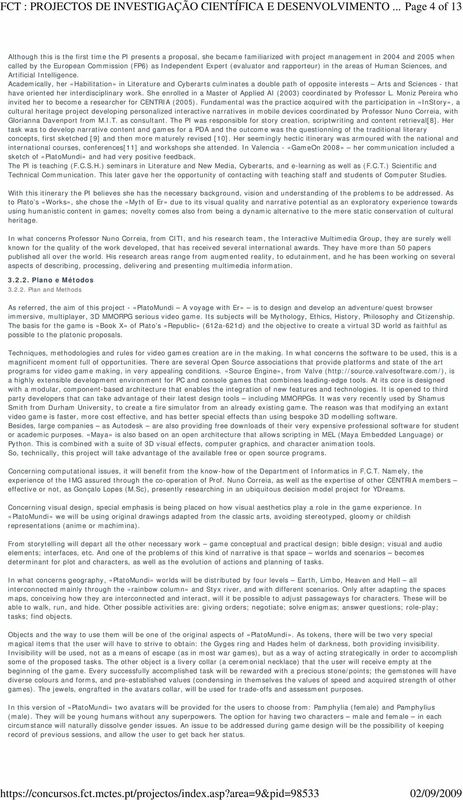 Techniques, methodologies and rules for video games creation are in the making. In what concerns the software to be used, this is a magnificent moment full of opportunities. There are several Open Source associations that provide platforms and state of the art programs for video game making, in very appealing conditions. «Source Engine», from Valve ( is a highly extensible development environment for PC and console games that combines leading-edge tools. At its core is designed with a modular, component-based architecture that enables the integration of new features and technologies. It is opened to third party developers that can take advantage of their latest design tools including MMORPGs. It was very recently used by Shamus Smith from Durham University, to create a fire simulator from an already existing game. The reason was that modifying an extant video game is faster, more cost effective, and has better special effects than using bespoke 3D modelling software. Besides, large companies as Autodesk are also providing free downloads of their very expensive professional software for student or academic purposes. «Maya» is also based on an open architecture that allows scripting in MEL (Maya Embedded Language) or Python. This is combined with a suite of 3D visual effects, computer graphics, and character animation tools. So, technically, this project will take advantage of the available free or open source programs. Concerning computational issues, it will benefit from the know-how of the Department of Informatics in F.C.T. Namely, the experience of the IMG assured through the co-operation of Prof. Nuno Correia, as well as the expertise of other CENTRIA members effective or not, as Gonçalo Lopes (M.Sc), presently researching in an ubiquitous decision model project for YDreams. Concerning visual design, special emphasis is being placed on how visual aesthetics play a role in the game experience. In «PlatoMundi» we will be using original drawings adapted from the classic arts, avoiding stereotyped, gloomy or childish representations (anime or machimina). From storytelling will depart all the other necessary work game conceptual and practical design; bible design; visual and audio elements; interfaces, etc. And one of the problems of this kind of narrative is that space worlds and scenarios becomes determinant for plot and characters, as well as the evolution of actions and planning of tasks. In what concerns geography, «PlatoMundi» worlds will be distributed by four levels Earth, Limbo, Heaven and Hell all interconnected mainly through the «rainbow column» and Styx river, and with different scenarios. Only after adapting the spaces maps, conceiving how they are interconnected and interact, will it be possible to adjust passageways for characters. These will be able to walk, run, and hide. Other possible activities are: giving orders; negotiate; solve enigmas; answer questions; role-play; tasks; find objects. Objects and the way to use them will be one of the original aspects of «PlatoMundi». As tokens, there will be two very special magical items that the user will have to strive to obtain: the Gyges ring and Hades helm of darkness, both providing invisibility. Invisibility will be used, not as a means of escape (as in most war games), but as a way of acting strategically in order to accomplish some of the proposed tasks. The other object is a livery collar (a ceremonial necklace) that the user will receive empty at the beginning of the game. Every successfully accomplished task will be rewarded with a precious stone/points; the gemstones will have diverse colours and forms, and pre-established values (condensing in themselves the values of speed and acquired strength of other games). The jewels, engrafted in the avatars collar, will be used for trade-offs and assessment purposes. In this version of «PlatoMundi» two avatars will be provided for the users to choose from: Pamphylia (female) and Pamphylius (male). They will be young humans without any superpowers. The option for having two characters male and female in each circumstance will naturally dissolve gender issues. An issue to be addressed during game design will be the possibility of keeping record of previous sessions, and allow the user to get back her status. NORMAS PARA AUTORES. As normas a seguir descritas não dispensam a leitura do Regulamento da Revista Portuguesa de Marketing, disponível em www.rpm.pt. 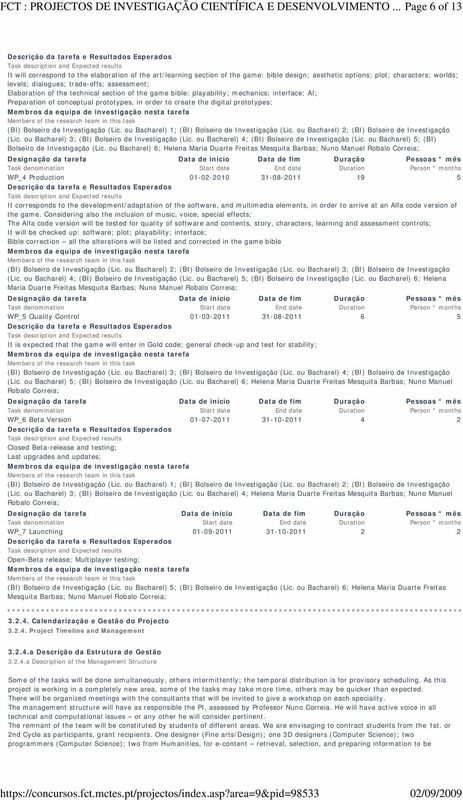 Mestrado em Ciências Jurídicas Especialização em História do Direito Unidade curricular História do Direito Português I (1º sem). Docente responsável e respectiva carga lectiva na unidade curricular Prof.
Ficha de unidade curricular Curso de Doutoramento Unidade curricular História do Direito Português I (Doutoramento - 1º semestre) Docente responsável e respectiva carga lectiva na unidade curricular Prof.
ACFES MAIORES DE 23 ANOS INGLÊS. Prova-modelo. Instruções. 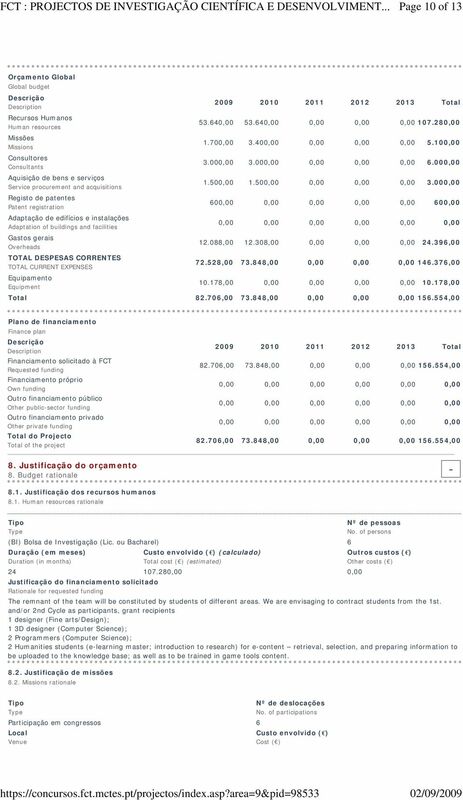 Verifique se o exemplar da prova está completo, isto é, se termina com a palavra FIM. 4. PLACEMENT OFFERED Number of Placement offered: Two places in the Romantic Museum of Macieirinha Farm. ISSN 0102-7077 the ESP São Paulo Vol. 25 nº especial p. 1-114 2004 The Especialist/Centro de Pesquisas, Recursos e Informação em Leitura da Pontifícia Universidade Católica de São Paulo CEPRIL. 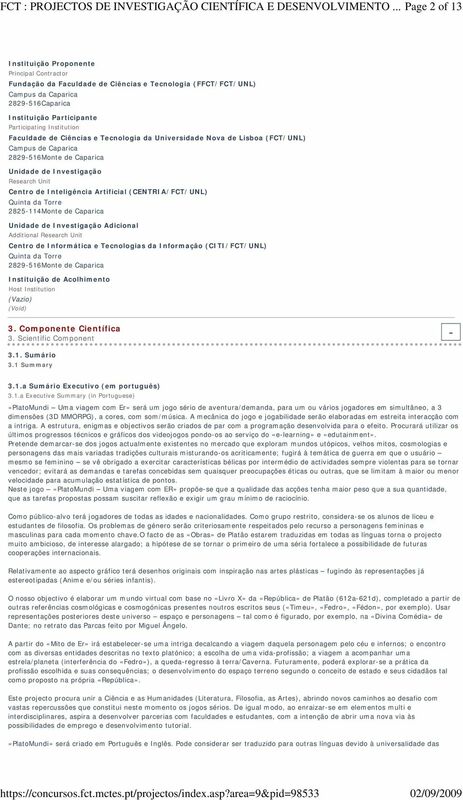 V. 1, n.
Palavras chave: trabalho colaborativo, desenvolvimento profissional, articulação curricular, tarefas de investigação e exploração. Visitor, is this is very important contact with you. WATH DO WE HERE? Reitor / President Marcos Macari, Ph.D. Vice-Reitor /Vice-President Herman Jacobus Cornelis Voorwald, Ph.D.
2. Conhecer a diversidade e complexidade de temáticas que podem ser abrangidas por esta área de conhecimento.